Our Heroes are playing some sort of advanced chess. Sheldon checkmates Leonard and we find out they are playing 3 dimensional chess. There is a knock and Penny walks in. Penny wants her mail and we find out that she has been visiting family in Nebraska. Penny says the trip was not so great as everyone got sick. Sheldon hears the word sick and we are off to the races. Sheldon wants to know what kind of sick. Penny doesn’t know and she doesn’t know when the symptoms started. Sheldon asks Penny to leave so she doesn’t spread the sick and Sheldon starts sparing Lysol…cue music. We see Sheldon in the kitchen making throat cultures. Leonard refuses to swab Sheldon’s throat. Sheldon explains that when he is sick in the hospital and inferior minds are trying to fix him, his cultures and notes will make it all ok. He then hands Leonard a glass-measuring cup and asks him to put it in the bathroom. When Leonard asks why, Sheldon explains that he has to measure his fluid intake and outtake. Leonard freaks because he mixes Pancake batter in that measuring cup! Sheldon is in bed and starts coughing. He uses a thermometer in his ear and hollers Leonard, I am sick. We pan to Leonard running out the door pulling his pants on. Sheldon comes out hollering for Leonard with his comforter wrapped around him. Sheldon drops his comforter and hollers for Leonard that he has dropped his comforter and can’t bend to pick it up because his sinuses hurt. When Sheldon realizes that Leonard isn’t home, Sheldon picks up the phone, he calls Leonard and wants to know where Leonard is. The camera pans to Leonard in the hall running down the stairs. He tells Sheldon he got called in to work, yes at 6am, yes on a Sunday. Sheldon says he was right he is sick. Sheldon’s mucus has gone from clear to milky green. We pan to Howard asleep and his phone ringing. Howard answers and it’s Leonard, Code Milky Green. Howard responds-Not Milky Green. Leonard and Howard are talking and the other line beeps in, Leonard tries to stop Howard from switching lines but Howard does anyway and it is Sheldon. Sheldon tells Howard he is sick. Howard pretends to me his mother and gets off the phone with Sheldon. Leonard says he tried to warn Howard and Howard responds he forgot about the protocols they put in place after the earache of 06. Leonard tells Howard to call Raj and they need to lay low for 18-22 hours. Howard asks if his friends can come over and Mom says no. Howard points out a “Planet of the Apes” marathon. Leonard does the math and 5 movies at 2 hours a movie is a good place to start. A waitress walks by Penny at the Cheesecake Factory and says homeless crazy guy at table 2. Penny looks over and there is Sheldon blowing his nose. Penny wants to know what Sheldon is doing there. Penny points out that she is not sick and Sheldon says Penny is a carrier. Penny wants to know why Sheldon didn’t have soup at home. Sheldon says he has an IQ of 187, if he could have had soup at home he would have. Penny points out; you can have soup delivered. 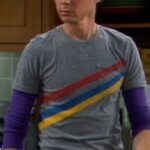 Sheldon says he must be delirious to not have thought of that. Sheldon ask for soup while he still knows what a spoon is for. We pan to the boys at the movie theater in Ape masks. Leonard’s phone rings and it is Penny. She asks him to come get Sheldon and Leonard lies and says he is at work and they are having an emergency. Sheldon and Penny are walking up the stairs at the apartment. Sheldon thanks Penny for bringing him home and Penny says sure she didn’t need to work to pay rent or car payments or anything-her sarcasm goes over Sheldon’s head. Penny heads to her apartment and Sheldon asks where Penny is going. Sheldon doesn’t want to be alone while he is sick. Penny agrees to take care of Sheldon but no sponge baths or enemas. We flick back to the guys at the movies, Leonard’s glasses fall off and Howard steps on them. Leonard is blind with out them and his only spare pair are at home. 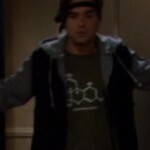 Leonard calls Penny and finds out she and Sheldon are at the boys’ apartment, he decides to try things with out his glasses. Penny is tucking Sheldon in and goes to leave when Sheldon asks Penny to rub Vapor rub on his chest. Penny tries to back out but Sheldon begs and then we see Sheldon’s chest and it is scary. Penny is rubbing Vapor Rub counter clockwise, per Sheldon’s instructions so his chest hair doesn’t matte. He then asks her to sing Soft Kitty….Penny is not familiar with this song. Sheldon then proceeds to teach her the song! Penny is slowing losing her patience (I can’t believe she has kept it this long). We then see a camera come up from under the door. The guys are in the hall; they have come for Sheldon’s glasses. Neither Raj nor Howard are willing to go in so Leonard has to wear a camera so the guys can be his eyes since he can’t see anything. Howard pulls out some sort of sonic thing that will send a signal to the laptop if Sheldon gets up and Leonard will have 7 seconds to get out of the apartment, glasses or no glasses. We see Leonard crawling into the apartment with the sonic sensor in his mouth. The guys crawl him into a wall when Leonard turns the corner the guys start to lose the picture. Leonard puts the sensor in front of the door and as Leonard crawls away, the sensor goes off. Howard has him turn his head back around and we see Penny-who is UPSET. Raj and Howard go running out the door. Sheldon hollers for Penny that he is hungry and Penny says good news Leonard is home. Penny runs out the door, Leonard tries to follow but runs into a wall. We see Leonard on the couch with an ice pack and Sheldon wrapped in a blanket.